So it’s November, Emily is 11 months old and whilst Sam and I try and figure out where the hell the past year has gone, in less than 4 weeks, our little bubba will be turning a year old. A bloomin’ year! That’s gone quick. Eeek! It’s difficult because whilst I’d love to do something for Emily, we can’t really do it at home because we don’t have much space and really she only has a few friends so hiring a place to accommodate her and her little friends will be madness and expensive. So whilst we rattle our brains, I googled the idea and came across a surprisingly large number of parents from all backgrounds who go all out for their child’s first birthday. Some are crazy, some normal and some so over-the-top-extravagant that I question why some people should be allowed to have that amount of cash in the bank. You can’t talk about parties without involving the one family that most sane people hate for being famous for nothing more than one family member shagging a rapper. The one the only Kim Kardashian. Kim Kardashian and Kanye West celebrated their daughter’s birthday with a massive party. Never being one to be normal and have a party down MacD’s, the Hollywood reality couple celebrated their eldest child’s birth with a festival theme based on Coachella, nicknamed Kidchella. The party, held on the grounds of their own home, had teepees, food stalls, bouncy castles and a Ferris wheel. North Kardashian West’s cousin Mason Disick, son of Kim’s oldest sister Kourtney an ex-partner Scott Disick had a circus themed first birthday with similar extravagance as North’s birthday. Little expense was spared with th celebrations, which included a carousel, petting zoo and a train set, as well as the usual balloons and cake! Mason’s sibling Penelope also had a crazy first birthday that was all sparkles and princess themed. 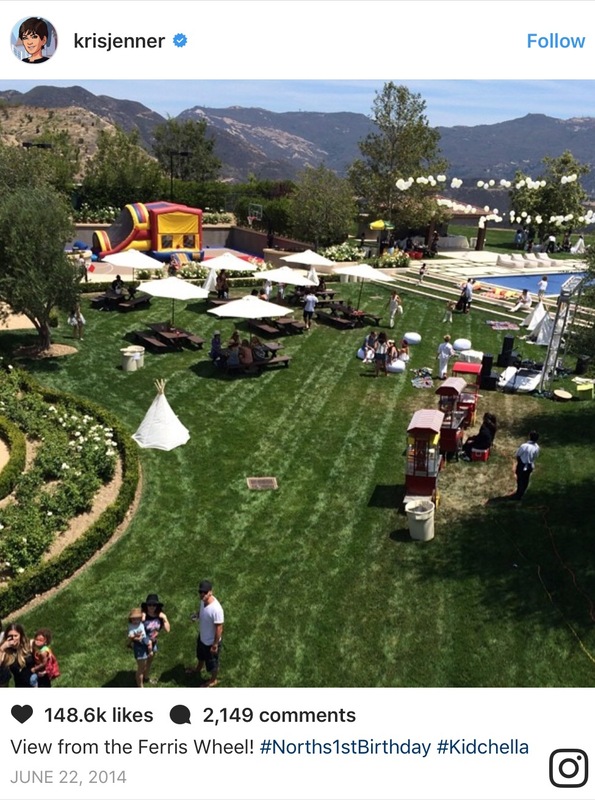 Kourtney and Scott really went all out making sure their little princess had the best princess party ever. There was a piglet dressed as a unicorn and 30 amazing balloons costing a whopping $150 each! Deciding to go for what we’d assume as less extravagant, Tori Spelling and Dean McDermot first birthday had a ladybug theme. Cute. But this ladybug party was another level, an epic level of mad extreme crazy. There was a ladybug zoo, pony rides, cookie decorating and a section to pot your own plants. If that wasn’t enough performers The Jumpitz were hired as entertainers and guests apparently went home with gift bags worth $2,500! We wouldn’t expect anything less of queen of screech Mariah zcarey and ex-partner Nick Cannon, who’s twins Moroccan and Monroe had a first birthday party like most adults would feel envious of. They were whisked off the fashion capital Paris for a, get this, black tie birthday party. The pair weren’t just going to receive your average presents either with diva Mariah as their mother! Gifts the twins received included a toy Ferrari, a rocking horse and a mini piano. DJ Khaled threw a Lion King themed party at a Miami party for his one-year-old, spending six figures and hosting it with fellow rap star Sean “P Diddy” Coombs. 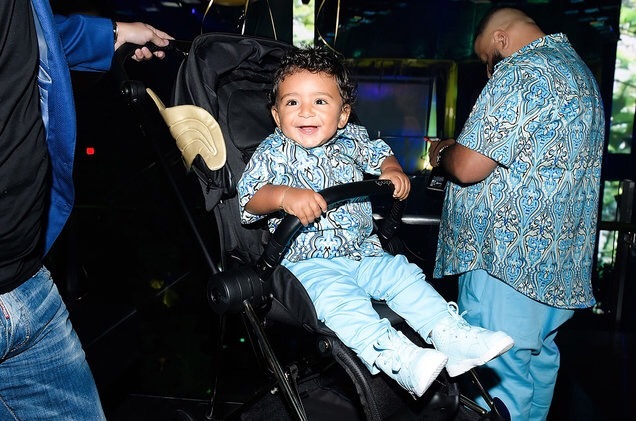 As if an extravagant birthday party wasn’t enough, Asahd also received a luxury gold watch worth $100k,in rose gold, doused in 11.5 carats of diamonds just because. Just ridiculous. Do you know any silly over-the-top birthday parties that I may have missed out? Previous Post TV in 2017 has been great… so far.